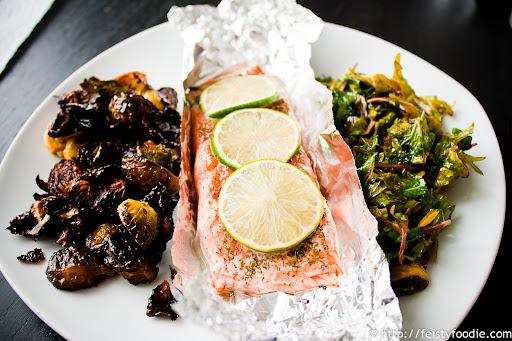 As I mentioned a few weeks ago, I had the great pleasure to try Verlasso salmon at Home. But the real test would be to try it at home. Eh? eh? See what I did there? Oh never mind. 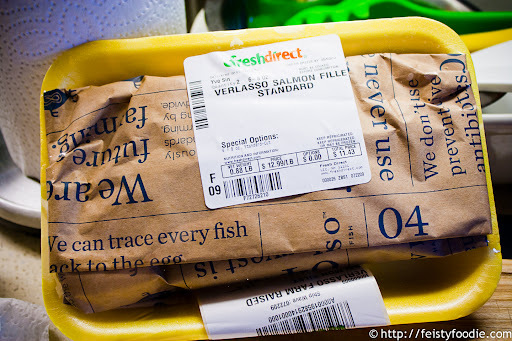 Regardless, as I mentioned last time, I received a $20 voucher to Fresh Direct (currently the only place to get Verlasso) with the idea that I would try cooking the salmon myself, so I decided to give it a whirl and make it for DLS. 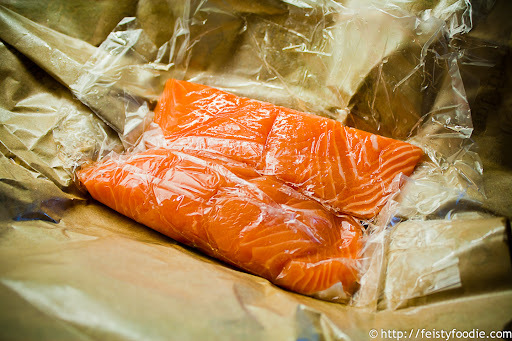 The salmon adorably comes wrapped in brown paper listing off just some of the positive attributes of the Verlasso salmon. Fun! The salmon was brilliantly vibrant and orange, gorgeous. 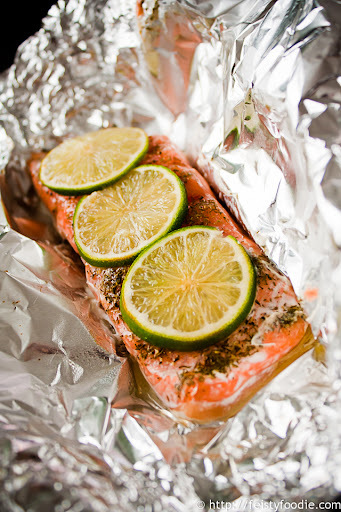 I chose to make the salmon en papillotte – which is just a fancy pants way of saying ‘in a pouch’. Honestly, though, I realized much later that I did it wrong… I’ve never cooked this way before, and I didn’t realize you need to add liquid to the packet. But… well, you’ll see. I served it with a side of roasted Brussels sprouts, but due to a miscommunication about when dinner should be served, they got a little over browned. Still delicious and super crispy, but not burned, just not the prettiest to look at. 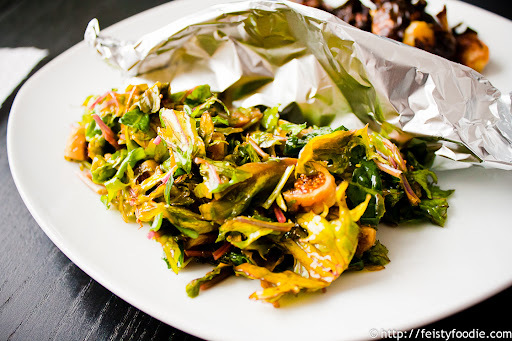 On the other side, I added more veggies – Earthbound Farms baby kale and dried Calimyrna figs with a simple lime vinaigrette. This went over very well! And the salmon, which I cooked to the rare side of medium rare, came out gloriously. This was also very well received! One of the lightest, healthiest meals I’ve made for DLS to date. 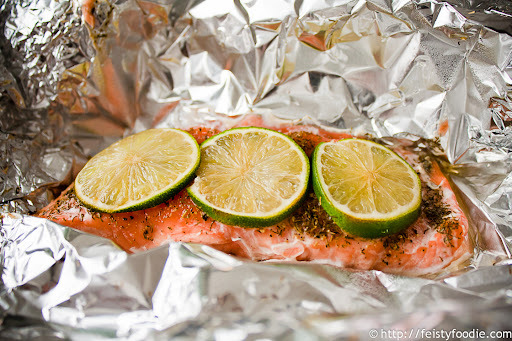 I had a lot of fun working with the Verlasso salmon, and found it flavorful and delicious. I highly recommend it for those who care about the origins of their fish, the sustainability and about a fish’s life before it gets to your plate. Bake in the oven for 12-15 minutes for rare to medium rare, up to a full 20 minutes for medium. Be careful when you take them out – it’s hot! 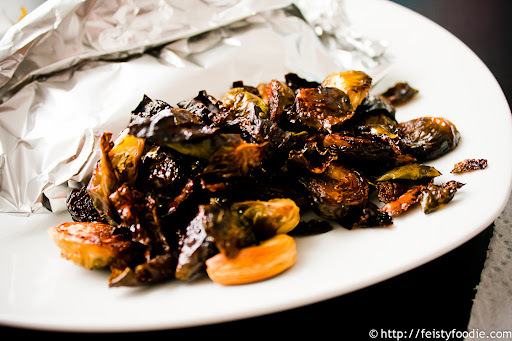 In a bowl, toss the Brussels sprouts with olive oil, salt, pepper and garlic cloves. 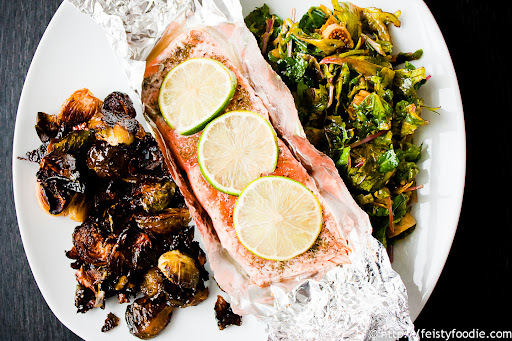 Once the oven has come to temp with the sheet pan inside, take the pan out and quickly spread the Brussels sprouts across it in a single layer, then replace inside the oven. Roast for about 20-30 minutes or until it’s as tender/cooked as you like. Try not to eat them all while they cool. Please note that as a result of the $20 gift certificate to Fresh Direct that I received, I did not pay for the salmon or the Brussels sprouts. I also received the Earthbound Farms kale mix from a Food Fete event that I attended, as I did with the Calimyrna figs as well. However, I was under no obligation to post about any of these items and received no monetary compensation to do so. 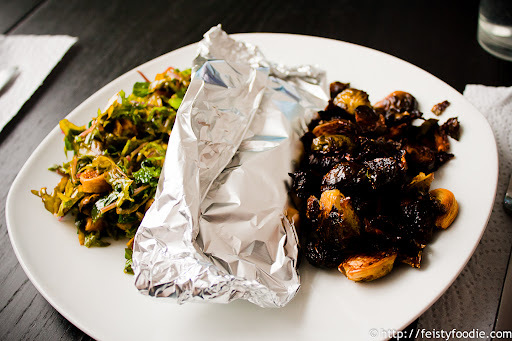 Hmm, haven’t really seen en papillotte using aluminum foil, mainly parchment. Interesting, interesting. Classically it’s parchment, but I’ve seen it with tinfoil. I don’t stock parchment so tinfoil makes more sense for me personally is all. Didn’t know there was a fancy name for it..
I’ve done that as well – but I wanted to keep my ‘sprouts crispy so I opted for a different route. That is definitely an option though!